Leading Manufacturer of body composition analyzer accuniq bc300 and body composition analyzer accuniq bc360 from Udaipur. Selvas Health care (Formerly known as JAWON medical Company Ltd), Korea is a leading Manufacturer of Premium and High Quality of Gym Equipment. 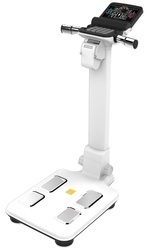 ACCUNIQ Body Analyzer Series is the only Series who uses 5 Factors ( Age , Gender , Height , weight and Impedance ) which is currently the latest technology in Body Composition and hence we have highest co-relation with DEXA result and the only company in world to achieve that and the same we have mentioned in all our product brochures which makes it legal. Sensational Design, Reliability & Convenience. The Product uses 5 Factors, viz. Weight, Height, Gender, Age and Impedance to analyze the whole body.